VARIETY OF SIZES - chairs has small and round legs, armchair has big and square legs and for Your vases needs a special size? We know of the individual needs of each client and give You best variety of felt furniture pads: brown 106 pads: (45) (24) 1" (36) 1x1" (1) 3x4" beige 27 pads: (10) " (8) 1 ' (4) 1 " (4) x6 " (1) 4 2/3x6". IF YOU WOULDN'T LIKE TO CONSTANTLY HAVE DEAL WITH SCRATCHES AND SCUFFS ON YOUR WOODEN AND LAMINATE FLOORS AND OTHER FURNITURE, PRESS THE BUTTON ADD TO CART RIGHT NOW! X-PROTECTOR FURNITURE FELT PADS - best protection for Your wooden, laminate or tiled floors. Our furniture coasters create strong shield between floor and furniture, desks & tabletops, which carefully protect surface from scratches and scuffs. ONLY NOW 1 + 1 PACK X-PROTECTOR ! 1 brown (106 piece) + 1 beige (27 piece). Total 133 chair glides. That's all furniture floor protectors You need at home - brown for dark furniture and beige for bright furniture. 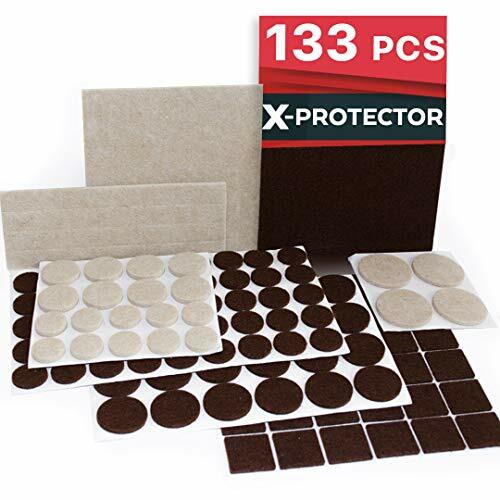 DIVERSITY SIZES X-PROTECTOR anti scratch furniture pads - brown 106: (45) , (24) 1, (36) 1x1, (1) 3x4 + beige 27: (10) , (8) 1, (4) 1 , (4) x6, (1) 4 2/3x6. A lot of sizes of chair leg floor protectors will ensures, You will find pads that fit to all of home furniture and items which you have. X-PROTECTOR SIUTABLE FOR ANY HOME FURNITURE - our wood floor protectors are perfect for any type of chair legs, furniture feet and other home furniture, electrical and other items. It's very easy to stick our felt floor protectors to Your home furniture and items. X-PROTECTOR IS A REGISTERED TRADEMARK - AVOID THE COPIES. WE GUARANTEE OUR CUSTOMERS 100% SATISFACTION WITH OUR PREMIUM FELT FURNITURE PADS! If You don't like our hardwood floor protectors - WE WILL REFUND YOUR MONEY - JUST TELL. ORDER IT NOW RISK FREE - PRESS THE BUTTON ADD TO CART RIGHT NOW! Our premium felt pads allow heavy furniture to move or slide on floor without scratching or damaging the floor. High quality and heavy duty felt pads are soft and protective without ripping or falling off easily. Providing the much needed protection for you wooden floor. The kit includes round and square felt furniture pads that can be cut into any size or shape you want. Cut them into shape and simply apply them as you need. Variety felt pads are designed not only for bottom of many furniture feet but also for various electronics and computers. Excellent for couches, chairs, cabinets, beds, desks, heavy appliances and electronics. Pads come in two colors; Brown and Beige, for color variation for multiple color choices of your furniture and floors. Package comes with 36 Clear Noise Reducer Bumper Grips for silencing the noise from drawers and cabinets. 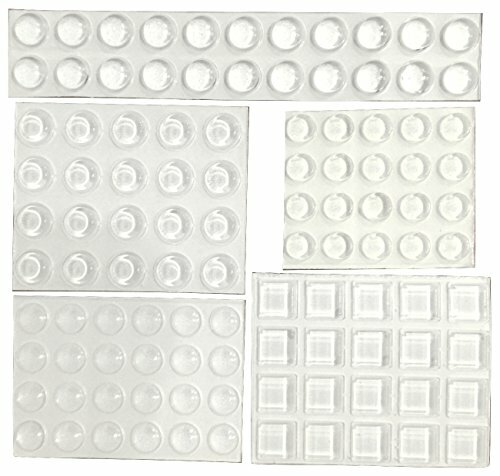 166-Piece Set Includes: (48) Inch Round (36) 1 Square (24) 1 Inch Round (12) 1.5 Inch Round (8) x 6 Inch Strips (2) 5 x 5 Inch Square (36) Clear Rubber Bumper Grips. Our Furniture Felt Pads are Backed by a LIFETIME Manufacturer's Quality Guarantee. 166-Piece Set Includes: (48) Inch Round (36) 1 Square (24) 1 Inch Round (12) 1.5 Inch Round (8) x 6 Inch Strips (2) 5 x 5 Inch Square (36) Clear Rubber Bumper Grips. The kit includes round and square felt furniture pads that can be cut into any size or shape you want. Cut them into shape and simply apply them as you need. Variety felt pads are designed not only for bottom of many furniture feet but also for various electronics and computers. Excellent for couches, chairs, cabinets, beds, desks, heavy appliances and electronics. Pads come in two colors; Brown and Beige, for color variation for multiple color choices of your furniture and floors. Our premium felt pads allow heavy furniture to move or slide on floor without scratching or damaging the floor. High quality and heavy duty felt pads are soft and protective without ripping or falling off easily. Providing the much needed protection for you wooden floor. Package comes with 36 Clear Noise Reducer Bumper Grips for silencing the noise from drawers and cabinets. 100% SATISFACTION GUARANTEE! If You do not like our furniture pads, we will refund your money! Simply send me a message for your refund. NO QUESTION ASKED! SlipToGrip Gripper Multi Size - Make 4", 1", 2", 1"x2"Pre-Scored to Make Multiple Sizes 3/8" Heavy Duty Felt Core with Anti Slip Rubber - No Nails, No Glue. Patent Pending. REGISTERED BRAND ON AMAZON: Gripper Square Furniture Pads Prevents Furniture from Sliding. "Pre-Scored" for EZ Cutting to Make Multiple Sizes . Dual technology by SlipToGrip - a leader in non-slip and traction. Newest Non-Slip Furniture Pads are perfect for ALL furniture. Furniture Stays in Place! Dual Technology - Anti Slip Rubber with 3/8" Solid Felt Core . Includes Pads - 4 inches by 4 inches. Includes Adhesive Strips to secure pad to leg bottom to TEMPORARILY SECURE while placing other pads (only use if needed to help align grippers) Pre-Scored Allows you to make almost Any Size -- Saves you Money. No Adhesive Necessary . No Nails. No Glue. Anti Slip Rubber Grips Furniture AND Floor . Protects and Safe on All Hardwood and Hard Floor Surfaces. Can be used under Heavy Conditions. Place under legs of furniture. Helps level furniture too -- sitting on a carpet and hard floor. Prevents heavy and sharp furniture legs from penetrating through to damage to any type of floor surface. FURNITURE USED WITH: Sectionals, Sofas, Chairs, Recliners, Tables, Beds and any furniture meant to stay in place. Made by the most trusted Amazon company -- Michigan based SlipToGrip, LLC. Registered Trademark USA. REGISTERED BRAND ON AMAZON: Protects and Anti Slip Pad with MULTIPLE SIZES - already "scored" to make easy cutting. Sizes 4"x4", 2"x2", 1"x2", 1"x1", 2" L Shape - You can make sixteen 2"x2" pads for example. Why buy anything else? Solid Felt Core. Anti Slip Rubber will not mark floors. Protects floors. No nails. No glue. Anti Slip rubber grabs leg and floor. Includes Adhesive Strips to secure pad to leg bottom to TEMPORARILY SECURE while placing other pads (only use if needed to help align grippers). Registered US Trademark - SlipToGrip. Patent Pending. Exclusive Rubber Layer -will not leave marks on floors. Waterproof - won't allow moisture to raise up to wooden legs. Only by SlipToGrip the leader in traction. SCRATCHES, SCRATCHES, SCRATCHES .it s made floor in Your lovely home. And moreover - Your bed is sliding from the wall to the wall. How much nervous do you spend every time when it happens? JUST STOP IT NOW WITH DOUBLE FURNITURE PADS X-PROTECTOR ! MAIN ADVANTAGES OF OUR FURNITURE PROTECTORS: HIGH QUALITY our furniture floor protectors are made by STRONG AND SOFT DOUBLE TECHNOLOGY with solid felt 1/5 and soft rubber. This makes soft and strong fixing of any furniture on the floor. TENACIOUS ADHESIVE - FORGET ABOUT COME OFF PADS! 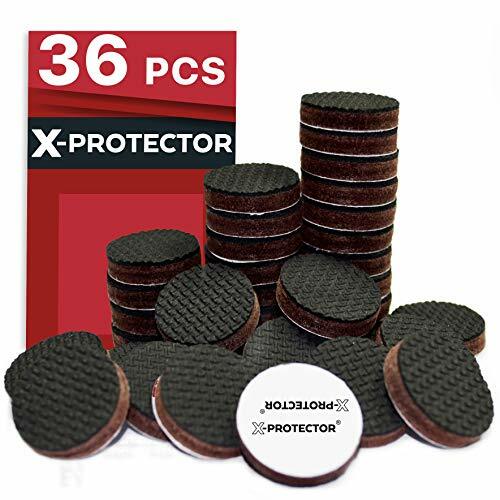 Our rubber pads X-PROTECTOR have tenacious adhesive which does not allow our furniture coasters to come off from furniture legs and it doesn t matter is it heavy or not. STRONG AND SOFT PROTECTION FOR YOUR LOVELY FLOOR our rubber feet X-PROTECTOR have new strong and damping construction and they provide the best careful protection for all types of Your lovely floor - Hardwood, Laminate, etc. IF YOU DON T LIKE CONSTANTLY TO HAVE DEAL WITH SLIDING AND SCRATCHING YOUR LOVELY FLOOR FURNITURE, PRESS THE BUTTON ADD TO CART RIGHT NOW! ELIMINATE THE POSSIBILITY OF SLIDING WITH NON SLIP FURNITURE PADS X-PROTECTOR ! SOFA MOVING TOO EASY AND INTERRUPT YOU REST ON IT? OR MAYBE YOUR CHAIR SLIDING TOO FAST AND SCRATCHING FLOOR? Anti slip rubber furniture pads X-PROTECTOR will keep in place all furniture and protect floor in Your lovely home from scratches! TENACIOUS ADHESIVE - FORGET ABOUT COME OFF FURNITURE GRIPPER! Our pads have tenacious adhesive which does not allow them to come off from furniture legs and tightly hold the pads for a long time. STRONG AND EFFECTIVE DOUBLE FURNITURE GRIPS - 16 SQUARE self stick furniture coasters made by thick felt 1/5 and soft rubber. This create heavy duty shield for all types of Your lovely floor (hardwood, laminate, vinyl, carpet) and stay in place any furniture. ANTI SKID FURNITURE STOPPERS PERFECT FOR ANY FURNITURE! Our rubber feet are perfect for any type of furniture - sofa, bed, dining chairs, table, couch, bed frame, etc. It's very easy to stick our anti slip wood floor protectors to furniture feet all types - square, round, etc. X-PROTECTOR IS A REGISTERED TRADEMARK - AVOID THE COPIES. WE GUARANTEE 100% SATISFACTION WITH OUR PREMIUM NON SLIP PADS! IF YOU DON'T LIKE OUR FURNITURE PADS - WE WILL REFUND YOUR MONEY - JUST TELL. ORDER IT NOW RISK FREE - PRESS THE BUTTON ADD TO CART RIGHT NOW! Avoid ruining the beauty and value of your home with scratches on your floors. Hardwood, laminate and tile floors can very easily be damaged by furniture without the proper leg padding. Even the most beautiful home can look shabby and unkempt if the flooring is scratched and scuffed. 30 - 0.4 inch Rubber Bumper pads for vases, doors, drawers and kitchen cabinets. STOP SCRATCHING YOUR FLOORS Place our felt furniture pads on the legs of your furniture to avoid scratching or scuffing your beautiful wooden, laminate or tiled floors. And you never have to hear that annoying scraping noise again. Protect the value and beauty of all floors with durable yet soft furniture pads on the feet of all furniture, including beds, desks, tables, chairs, sofas, electrical appliances, bar stool and cabinets. 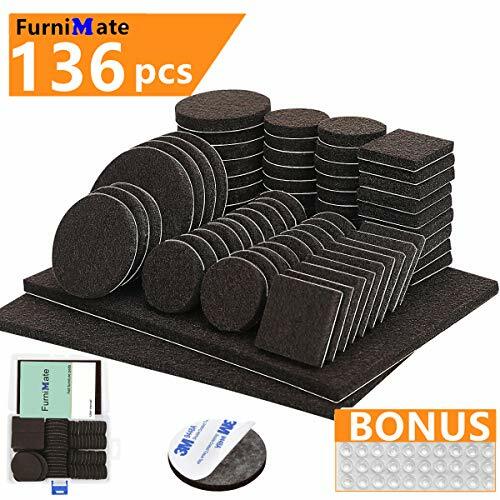 LARGE VARIETY PACK Our 136PCS Pack with Storage Case contains furniture pads of the 6 most useful sizes, round & square and in dark brown: (52) 1, (20) 1.5, (4) 2, (28) 1x1 and (2) 4x6. Plus you get (30) 0.4clear rubber bumper pads. 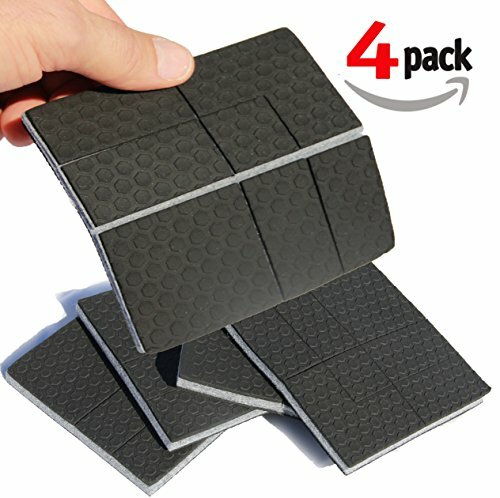 These should be more than enough coaster pads to protect all your floors from being damaged by ugly scratches. STRONG ADHESIVE BACKING Premium heavy-duty soft furniture leg pads 0.2inch thick with a very sticky self-adhesive backing to ensure the pads stay in place. Our top-quality felt pads are made of the most advanced materials, designed for many years of use. To protect the value and beauty of your floors from unsightly scratches and scuffs, our premium quality furniture leg pads are a must! QUICK & EASY SOLUTION All you do is clean, peel, and stick the furniture pads. Furniture and floor surfaces should be cleaned of any dirt, debris or sand to ensure a strong bond. You can customize the size by cutting the furniture pads into any shape that fits your furniture. Extra furniture pads can be easily kept in the handy storage case. 100% GUARANTEE All customers receive a lifetime 100% satisfaction guarantee, making this furniture pad a risk-free purchase. We take pride in providing the highest quality and most durable felt furniture pads on the market are happy to guarantee our product. If you have any problem at all, please contact us so that we can resolve your problem. 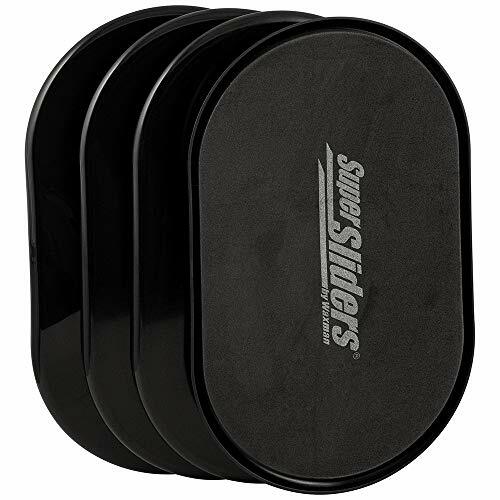 Protect all of your household floors and surfaces from scratches and marring from everyday use and movement with these reusable SuperSliders Furniture Round Felt Pads for hard surfaces. 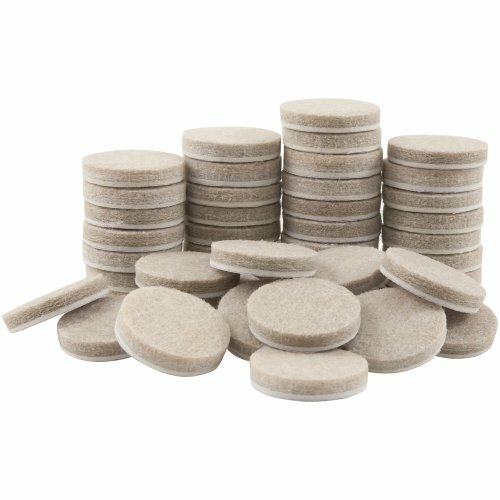 Not only will these round felt pads for furniture protect your beautiful floors from damage, they ll help reduce noise and friction from everyday use. You ll never have to listen to annoying scraping of a chair against a hard surface ever again! 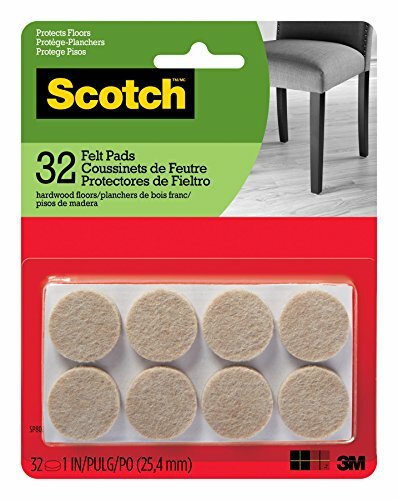 These long-lasting, heavy-duty furniture round felt pads are super durable with a self-stick adhesive for easy application and lasting protection. These pads can be used on tables, cedar chests, chairs, curio cabinets, desks and much more. Each value pack includes 48, 1 diameter round, linen color furniture felt pads they re an essential purchase for every household! 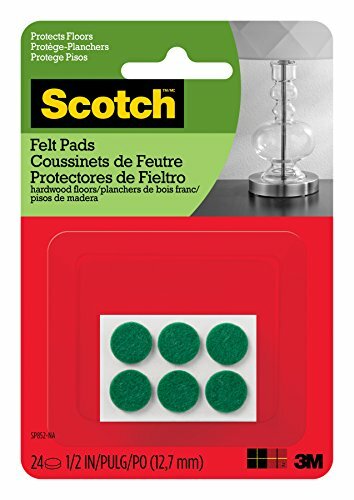 Preserve the beauty of your floors with Scotch Felt Pads. Equipped with powerful adhesive and durable felt, these floor protectors adhere effortlessly to the legs of your furniture and provide long-lasting protection from gouges and scratches. They come in multiple sizes and colors, so there's a set that blends perfectly with all of your d cor. So help protect your investment, and enjoy your beautiful floors for years to come with Scotch Felt Pads. 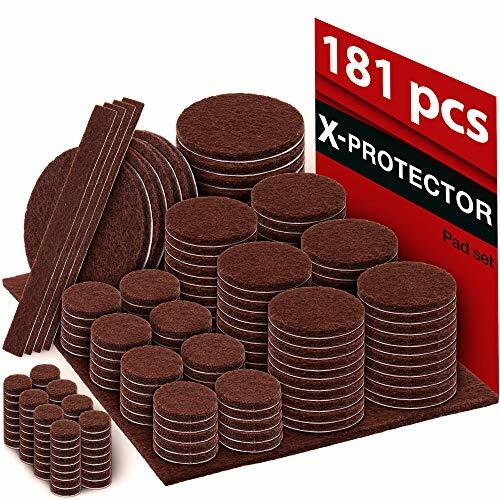 X-PROTECTOR Premium ULTRA LARGE Pack Felt Furniture Pads 181 piece! Felt Pads Furniture Feet ALL SIZES Your Best Wood Floor Protectors. Protect Your Hardwood Flooring with 100% Satisfaction! BEST AND LARGEST VARIETY OF SIZES - for total protect furniture surfaces in Your home we made largest variety of sizes for all items in Your home. 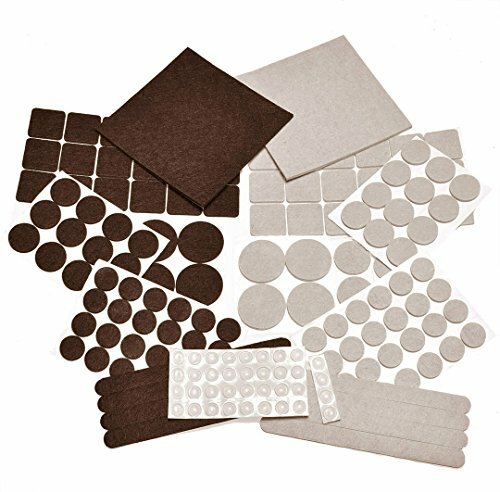 For your individual needs we have piece of felt which You can cut out to any shapes and sizes: Brown 181 furnature pads: (64) 3/8" (40) " (60) 1" (8) 1 " (4) 2" (4) x6" (1) 4 1/3x6" . FORGET ABOUT SCRATCHES! Furniture felt pads X-PROTECTOR - best protection for Your wooden, laminate or tiled floors in Your lovely home. Our furniture coasters create strong shield between floor and furniture, desks & tabletops, which carefully protect surface from scratches and scuffs. ONLY NOW ULTRA LARGE PACK ALL SIZES X-PROTECTOR - brown 181 piece: (64) 3/8, (40) , (60) 1, (8) 1 , (4) 2, (4) x6, (1) 4 1/3x6. A lot of sizes of chair leg floor protectors will ensures, You will find furnature pads that fit to all of home furniture and items which you have. X-PROTECTOR HAS STRONG MATERIAL AND TENACIOUS ADHESIVE! Our chair floor protectors are made of strong eco-friendly material with recycled fibers. Tenacious adhesive guaranteed You can easy stick it to any furniture surface and be sure it will hold on and protect for a long time. Protect all of your household floors and surfaces from scratches and marring from everyday use and movement with these nail-on felt pads for wood furniture and hard surfaces. Not only will these furniture felt pads protect your beautiful hardwood, ceramic or lineolum floors from damage, they ll help reduce noise and friction from everyday use. You ll never have to listen to annoying scraping of a chair against a hard surface ever again! These felt pads for wood furniture have easy nail-on installation, and nailing a pad into a wooden furniture leg provides a superior hold that is sure to last the test of time. The heavy-duty felt pads can be used on wooden tables, cedar chests, chairs, curio cabinets, desks, and a variety of other wooden furniture items. 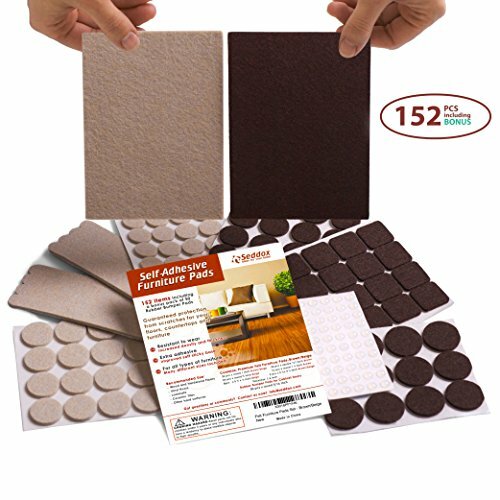 Each pack includes 48 brown 1 round furniture protecting felt pads they re an essential purchase for every household! SCRATCHES, SCRATCHES, SCRATCHES....it's made floor in Your lovely home. And moreover - Your couch & dining chairs and beds are sliding from the wall to the wall all the time. How much nervous do you spend every time when it happens? JUST STOP IT NOW WITH NON SLIP FURNITURE PADS X- PROTECTOR! HIGH QUALITY NON-SKID PADS - our square anti slip furniture pads - floor protectors are made by new TRIPLE TECHNOLOGY with two layers of soft rubber and high-quality thick felt between them. Such construction give our table stoppers soft and strong fixing of any furniture leg on the floor surface and protect from scratch. TENACIOUS ADHESIVE - FORGET ABOUT COME OFF NONSKID FURNITURE PADS! Our no-skid rubber pads are SELF STICK - it doesn't allow them to come off from furniture legs and it doesn't matter is it heavy or not. STRONG AND SOFT PROTECTION FURNITURE PADDING FOR YOUR LOVELY FLOOR - our antiskid rubber pads furniture stopper X- PROTECTOR have new strong and damping construction and they provide the best careful protection for all types of Your lovely floor - Hard wood, Laminate, Tile, etc. It's best couch slide stopper & table leg pads. BIG SIZE SQUARES 4 inch - BEST floor protectors chair leg covers for stay in place heavy furniture as and prevent sliding, make safety for Your floor. Our no slide furniture pads will keep the furniture! Use our non slide furniture pads - furniture stoppers to prevent sliding and as table floor protector. IF YOU DON'T LIKE CONSTANTLY TO HAVE DEAL WITH SLIDING AND SCRATCHING YOUR LOVELY FLOOR, PRESS THE BUTTON ADD TO CART RIGHT NOW - AND NO MORE SLIDING! ELIMINATE THE POSSIBILITY OF SLIDING WITH NON-SLIP FURNITURE PADS X-PROTECTOR! SOFA MOVING TOO EASY AND INTERRUPT YOU REST ON IT? OR MAYBE YOUR CHAIR SLIDING TOO FAST AND SCRATCHING FLOOR? No skid furniture grippers X-PROTECTOR will keep in place all furniture and protect floors in Your lovely home from scratches and scuffs! X-PROTECTOR TENACIOUS ADHESIVE - FORGET ABOUT COME OFF ANTI SKID FURNITURE GRIPS! Our hardwood floor protectors X-PROTECTOR have strong adhesive which will tightly hold the nonskid furniture pads for a long time. ONLY NOW 8 NON SKID FURNITURE STOPPERS 4 X-PROTECTOR ! Our furniture coasters made by TRIPLE COMBINED TECHNOLOGY - two layers of soft rubber and solid felt between them create careful protection for all types of Your floor (wood, laminate, tile, carpet). SUITABLE FOR ANY FURNITURE - IDEAL FOR HEAVY! 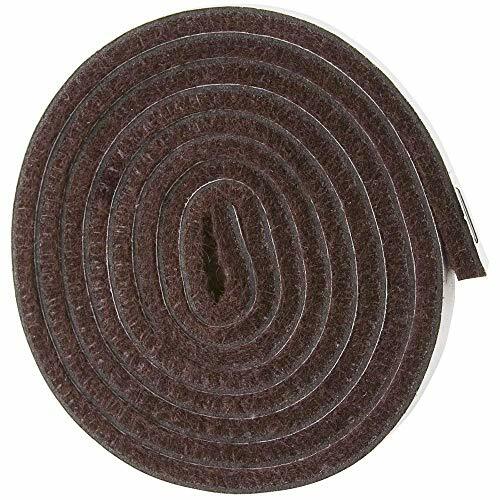 Our rubber grip furniture pads for hardwood floor are perfect for any type of furnature - sofa, bed, recliner, table, dining chairs, couch, bed frames, etc. It's very easy to stick our rubber feet - no slip floor protectors to any furniture feet. X-PROTECTOR IS A REGISTERED TRADEMARK - AVOID THE COPIES. WE GUARANTEE 100% SATISFACTION WITH OUR PREMIUM NON SLIP FLOOR PROTECTORS! IF YOU DON'T LIKE OUR ANTI SLIDE FURNITURE PADS - HARDWOOD FLOOR PROTECTORS - WE WILL REFUND YOUR MONEY. ORDER IT NOW RISK FREE - PRESS THE BUTTON ADD TO CART RIGHT NOW! CHAIR MOVING TOO EASY AND SCRATCHING FLOOR? 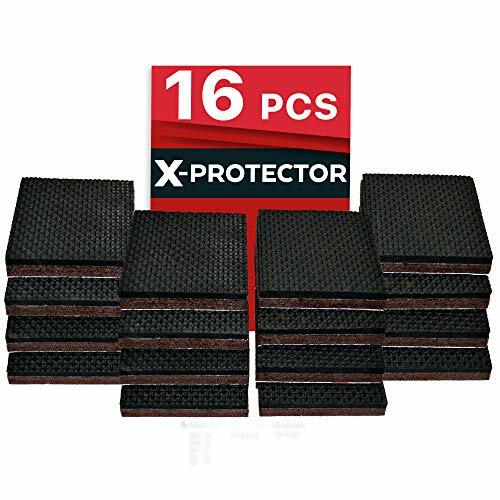 Premium rubber furniture pads X-PROTECTOR will keep in place all furniture and protect floors in Your lovely home from the scratches! X-PROTECTOR 36 pcs 1 Round PREMIUM FURNITURE GRIPS SUITABLE FOR ANY LIGHT FURNITURE! Our anti slip furniture pads for hardwood floor are perfect for any type of light furniture and WILL STOP IT - dining chairs, table, cabinet, stools, sofa, couch. X-PROTECTOR TENACIOUS ADHESIVE - FORGET ABOUT COME OFF FURNITURE GRIPPERS! Our hardwood floor protectors have tenacious adhesive which will hold grippers on the furniture for a long time. And it's so easy to stick our floor protectors to the furniture feet! X-PROTECTOR STRONG AND EFFECTIVE DOUBLE PADS - our magic furniture coasters made by SOLID FELT 1/5 AND SOFT RUBBER with tenacious adhesive. This combination create strong and soft careful shield for all types of Your lovely floor (hardwood, laminate) and keep in place any furniture. X-PROTECTOR IS A REGISTERED TRADEMARK - AVOID THE COPIES. WE GUARANTEE OUR CUSTOMERS 100% SATISFACTION WITH OUR PREMIUM NONSKID FLOOR PROTECTORS! IF YOU DON'T LIKE OUR HARDWOOD FLOOR PROTECTORS - WE WILL REFUND YOUR MONEY - JUST TELL. ORDER IT NOW RISK FREE - PRESS THE BUTTON ADD TO CART RIGHT NOW! And moreover - Your bed is sliding from the wall to the wall. JUST STOP IT NOW WITH DOUBLE furnature pads X-PROTECTOR ! HIGH QUALITY - our furniture floor protectors are made by STRONG AND SOFT DOUBLE TECHNOLOGY with solid felt 1/5"and soft rubber. This makes soft and strong fixing of any furniture on the floor. TENACIOUS ADHESIVE - FORGET ABOUT COME OFF PADS! Our rubber pads X-PROTECTOR have tenacious adhesive which does not allow them to come off from furniture legs and it doesn't matter is it heavy or not. STRONG AND SOFT PROTECTION FOR YOUR LOVELY FLOOR - our rubber feet X-PROTECTOR have new strong and damping construction and they provide the best careful protection for all types of Your lovely floor - Hardwood, Laminate, etc. ROUND FORMAT - You can use our pads on any form of Your furniture leg - it doesn't matter round it or square - round format will fit and fix ALL! IF YOU DON'T LIKE CONSTANTLY TO HAVE DEAL WITH SLIDING AND SCRATCHING YOUR LOVELY FLOOR FURNITURE, PRESS THE BUTTON ADD TO CART RIGHT NOW! ELIMINATE THE POSSIBILITY OF SLIDING WITH NON SLIP FURNITURE PADS X-PROTECTOR ! SOFA MOVING TOO EASY AND INTERRUPT YOU REST ON IT? OR MAYBE YOUR CHAIR SLIDING TOO FAST AND SCRATCHING FLOOR? Anti skid rubber furniture pads X-PROTECTOR will keep in place all furniture and protect floors in Your lovely home from scratches! TENACIOUS ADHESIVE - FORGET ABOUT COME OFF FURNITURE GRIPERS! Our anti slide hardwood floor protectors have strongest adhesive which does not allow them to come off and tightly hold anti slip pads on the furniture legs for a long time. 8 STRONG AND EFFECTIVE DOUBLE FURNITURE GRIPS - 2 ROUND self stick furniture coasters made by thick felt 1/5 and rubber. This create strong and soft surface protector for all types of Your lovely floor (wood, laminate, etc) and stay any furniture in place. OUR FURNITURE STOPPERS PERFECT FOR ALL! Anti slip pads for hardwood floor are perfect for all furniture - sofa, bed, table, couch, dining chairs. It's very easy to stick our anti skid furnature pads and all furniture will stay in place & wouldn't slide anymore. It's great stopper! X-PROTECTOR IS A REGISTERED TRADEMARK - AVOID THE COPIES. WE GUARANTEE 100% SATISFACTION WITH OUR PREMIUM NON SLIP FLOOR PROTECTORS! IF YOU DON'T LIKE OUR PADS - WE WILL REFUND YOUR MONEY. ORDER IT NOW RISK FREE - PRESS THE BUTTON ADD TO CART RIGHT NOW! Do you love beautiful natural wood or hardwood flooring? Are you are sick and tired of multiple scratches on the floor after moving furniture and you can't stand that slam-bang clatter when you just move chairs? Using OUR PREMIUM FELT PADS you protect your floors against scratches and they will always look at their best without any additional effort - you just need to apply our pads to your furniture. Compared to cheaper pads, OUR FELT PROTECTORS have a HIGHER DENSITY of 900 g/m2 and a THICKNESS of 1/6 inch. Due to their soft EXTRA ADHESIVE bottoms, our FELT FURNITURE PADS can be effectively fixed to ANY SURFACES, even uneven ones. You can MOVE YOUR FURNITURE when you like, as our FLOOR PROTECTORS will remain effectively fixed. 100% LIFETIME WARRANTY! We are sure of the quality of our product, but we still want you to be confident of your choice, If you don't like it or it is not something you were looking for - we will return your money immediately. So throw away any doubt, scroll up to the top of the page and press the "ADD TO CART" button right now. SAVE YOUR MONEY WITH SEDDOX! Scroll up slightly to "Special Offers and Product Promotions" and check our latest offers! REALY LARGE SET OF FELT PADS - 152 PIECES including BONUS PACK of 50 rubber bumper pads! When you buy our floor protector pads you get a large set of furniture pads of different size that you could use for any furniture, plant pots, lamps, vases, dishes and any other items that you may use at home. SAVE YOUR MONEY by buying 2 or more sets! Scroll down to "Special Offers and Product Promotions"
100% LIFETIME WARRANTY. We will return your money upon your request in the unlikely event that you don't like our pads or they were not what you were looking for. You can order our premium heavy duty furniture felt pads right now - with NO RISK at all! And moreover - Your bed is sliding from the wall to the wall and sofa is in a different place always! JUST STOP IT NOW WITH NON SLIP FURNITURE PADS X-PROTECTOR ! HIGH QUALITY - our non skid floor protectors are made by new DOUBLE TECHNOLOGY - construction of thick felt 1/5" and soft rubber makes soft and strong slip resistant furniture pads. TENACIOUS ADHESIVE - FORGET ABOUT COME OFF FURNITURE COASTERS! Our self adhesive rubber pads X-PROTECTOR have strongest adhesive which does not allow them to come off from furniture legs and it doesn't matter it is heavy item or not. 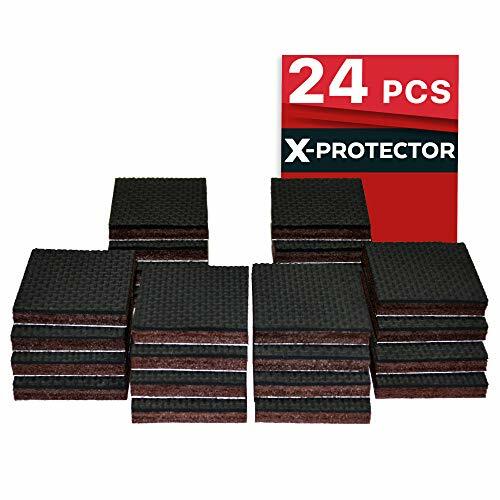 STRONG AND SOFT PROTECTION FOR YOUR LOVELY FLOOR - our non-skid rubber pads X-PROTECTOR have new strong and damping construction and they provide the best careful protection for all types of Your lovely floor - Hardwood, Laminate, Tile, Vinyl, Carpet, etc. 24 PCS 1 1/2" - BEST nonskid floor protectors for stay in place Your furniture and make safety for Your floor. PERFECT FOR ALL FURNITURE - dining chairs, recliner, sofa, etc. Get Your new couch coasters! ELIMINATE THE POSSIBILITY OF SLIDING WITH PREMIUM NON SLIP FURNITURE PADS X-PROTECTOR ! SOFA MOVING TOO EASY AND INTERRUPT YOU REST ON IT? OR MAYBE YOUR COUCH SLIDING TOO FAST AND SCRATCHING FLOOR? 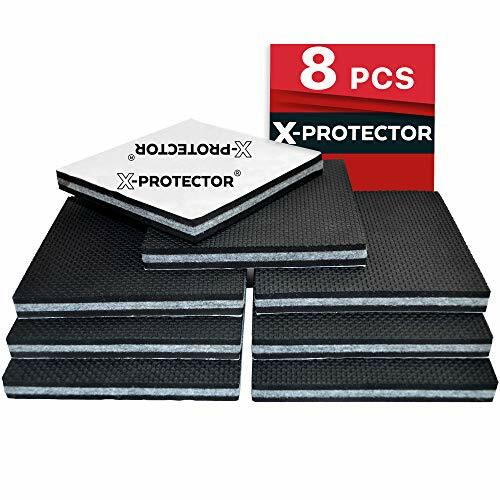 Premium rubber furniture pads X-PROTECTOR will keep in place all furniture and protect floors in Your lovely home from the scratches! 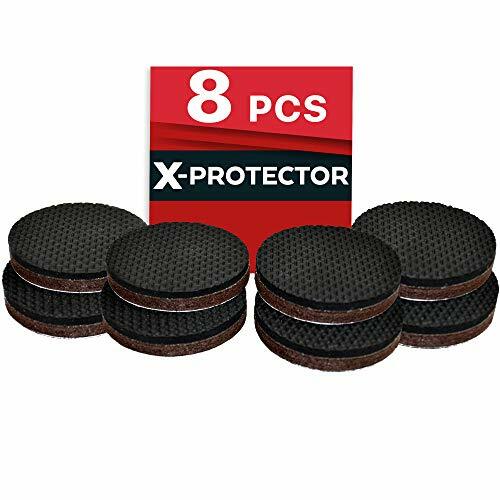 X-PROTECTOR 24 pcs 1 1/2 PREMIUM ANTI SLIP FURNITURE GRIPS SUITABLE FOR ANY FURNITURE! Our furniture pads for hardwood floor are perfect for any type of furniture and WILL STOP IT ALL - sofa, bed, table, stools, etc. X-PROTECTOR TENACIOUS ADHESIVE - FORGET ABOUT COME OFF FURNITURE GRIPPERS! Our self stick pads have strongest adhesive which will hold pads on the furniture for a long time. And it's so easy to stick our floor protectors to the furniture feet! X-PROTECTOR STRONG AND EFFECTIVE ANTI SKID DOUBLE PADS - our furniture coasters made by SOLID FELT 1/5 AND SOFT RUBBER. This create strong and soft careful shield for all types of Your lovely floor (hardwood, laminate, carpet) and keep in place any furniture. X-PROTECTOR IS A REGISTERED TRADEMARK - AVOID THE COPIES. WE GUARANTEE 100% SATISFACTION WITH OUR PREMIUM NON SLIP FLOOR PROTECTORS! IF YOU DON'T LIKE OUR HARDWOOD FLOOR PROTECTORS - WE WILL REFUND YOUR MONEY - JUST TELL. ORDER IT NOW RISK FREE - PRESS THE BUTTON ADD TO CART RIGHT NOW! Premium Quality Clear Bumper Pads Combo Pack! Protect your cabinets, glass table tops, furniture, decor, walls and floors with these premium surface cushion guards! Applications include Cabinets, Drawers, Glass Products, Cutting Boards, Sliding Doors, Furniture, Windows, Wall Hangings, Plastics, Small Appliances, Audio & Video Equipment, Computers, Laptops, Wall Protection, Corner Protection and many other uses at your Home and Office. 106-PIECE COMBO PACK: Includes small bumpers in different shapes and widths to cater to all your needs. Package includes Flat Circle, Spherical and Square shaped bumpers in various sizes. CUSHIONING & DAMPENING: These premium bumper pads are great for cabinets, doors, drawers, picture frames and glass table tops - providing cushioning to prevent damage from accidental slamming, banging and closing. Use as a spacer to give extra rise to a frame or artwork hanging on a wall to get the perfect look! Can also be used like felt or rubber pads on chair, table and desk legs to prevent your floors from scratches. PROTECT FURNITURE TOPS: Protect your furniture from wear and tear. Stick these surface guards to the bottoms of boxes, vases, cutting boards and other trinkets and gadgets that sit on tables or counters made of glass, wood, marble or any other material you do not want to damage or scratch. SLEEK DESIGN: Clear pads stick onto the bottoms, doors, legs, backs (or anywhere) on furniture, picture frames or home decor for a non-intrusive way to add protection without compromising your interior design or look of a room. SELF-ADHESIVE: Easy to use with the self adhesive that easily sticks to tables, desks, banisters, cabinets or any other furniture that needs cushioning or sound dampening. Sticks to glass, wood, metal, ceramic, granite and more! Do you want to keep furniture from scratching your wooden floors? The majority of scratches on hardwood surfaces are caused by sliding furniture around without any padded protection. Fixing scratches on ceramic tile, laminate, vinyl and hardwood floors can be costly and time-consuming. Furniture sliders for hardwood floors allow your furniture or chairs to glide smoothly or quietly across many surfaces. Want to move your chairs and furniture without worrying about any nerve-wracking noises? That's why we at Gossip worked hard to create a safe but simple solution for you, to dampen that noise and make your furniture easy (and safer) to move by using floor protectors for furniture legs. We found the right balance between felt feet thickness and density, which gives you the right stability, as well as the long-lasting protection effect you want. Our furniture sticky pads are made from heavy duty felt, which keeps its shape longer than any of the other furniture leg pads. Adding adhesive felt bumpers under furniture provides a soft, scratch proof, inch barrier between your furniture and floor surfaces. What You'll Get With Your Purchase: Choosing how many pieces, (and which packs), of floor protectors to order can be overwhelming, so we've made it easy for you to get what you need. We put 6 most popular sizes in our large pack of heavy duty felt pads, so you'll be getting a convenient package that includes: - 24 pcs x round 3/4 inch - felt pads for chair legs - 24 pcs x square 1x1 inch - for arm-chairs and coffee tables - 48 pcs x round 1 inch - for chairs, arm-chairs and stools - 12 pcs x round 1 1/4 inch - for dining tables, sofas, beds, wardrobes - 8 pcs x 5 x inch strips - for decorative objects and electronics - 2 pcs x 5 x 4 inch - two large-size rectangular sheets for heavy furniture, like beds, cabinets and dressers. You can cut it into any shape and size or use standard-sized pads. Chair leg floor protectors - the best solution to eliminate scratches. HIGH-DENSITY FURNITURE FOOT PADS FOR LONGER PROTECTION. Protect tile, marble, vinyl, laminate or hardwood floor surfaces from scuffs and scratches. BONUS: 50 CLEAR SOUND DAMPENING BUMPER PADS for quiet closing cabinet doors and drawers. EXTRA-STRONG ADHESIVE FELT PAD for chair legs or other furniture. 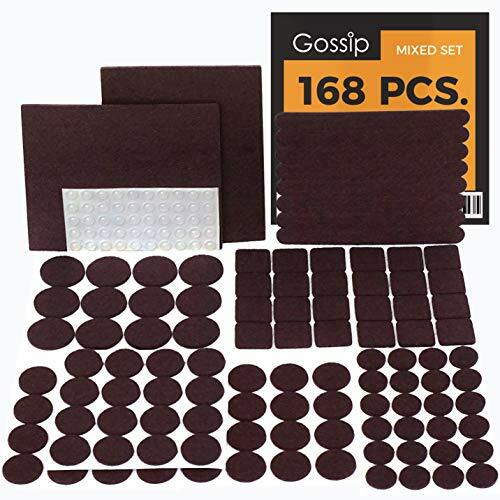 Gossip anti scratch furniture pads made of high-density felt inches (3mm) thick. LARGE SET OF MOST POPULAR SIZES AND SHAPES IN ZIPPER BAG. Floor protection for hard wood flooring that is extremely easy to use. BUY 2 SAVE 10%, BUY 3 SAVE 12%. Pick up 2 or more of Gossip furniture protectors out of the catalog and immediately save up to 12% at checkout (no coupon necessary). Buy for a friend or neighbor and save together. This furniture pads including multiple sizes and shapes to meet your no-screech & no-scratches home needs, and it's a breeze to cut them to whatever size you need. And Why Yelanon furniture pads could rescue you from freaking out about all kinds of scratches and scuffs on your floor? 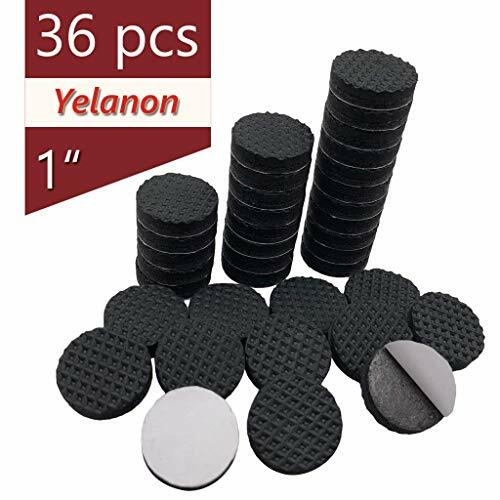 High quality: Yelanon self-adhesive furniture pads are designed to eliminate the worries of scratches upon the furniture surface, not only can you keep our premium furniture pads in place to protect your wooden, laminate or tile floors, also worked in Tables, Cabinets, Lamps and more. Tenacious adhesive and easy to install: You can simply peel off the backing and put on the piece you want to use it on, and we do suggest that you should make furniture leg surface is clean, dry, smooth before install our pads, to prolong its life-span. Non-slip: Our premium furniture pads consist of a solid felt layer and rubber foam layer, soli felt is strong protection from the pressure of your furniture, and rubber foam is for fixing furniture in place, to prevent sliding and scuffs, especially works great with heavy furniture. Small parts, choking hazard, keep out of the reach of children. BEST PROTECTION - Furniture felt pads This create heavy duty shield for all types of Your lovely floor (hardwood, laminate, vinyl, carpet) & (sofa, bed, recliner, table, dining chairs, couch, bed frames, etc), which carefully protect surface from scratches and scuffs. 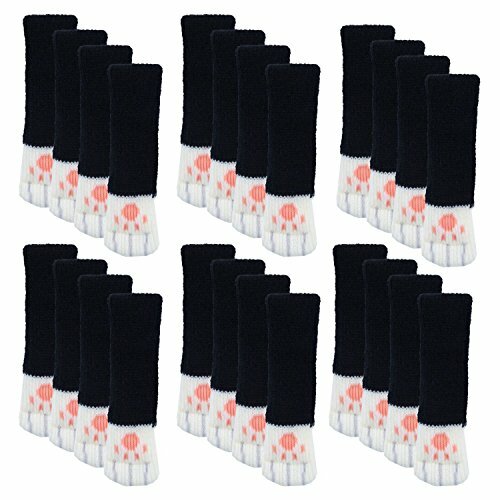 36 pcs 1 Round PREMIUM FURNITURE GRIPS SUITABLE FOR ANY LIGHT FURNITURE! Our anti slip furniture pads for hardwood floor are perfect for any type of light furniture and WILL STOP IT - dining chairs, table, cabinet, stools, sofa, couch. STRONG AND EFFECTIVE DOUBLE FURNITURE GRIPS - 36 pcs 1 PREMIUM FURNITURE PADS SUITABLE FOR ANY LIGHT FURNITURE! Non Slip Furniture pads can be used to cover most furniture and appliances to prevent nicks ,protect floors from chair legs, furniture feet electrical and other items. ELIMINATE ANNOYING NOISE - No more the annoying scraping sound of a chair or moving furniture being pushed against hard floor- soft felt pads help you to reduce noise and make a more peaceful home. Glass Top Table Bumpers with Stem,Glass Top Rubber Grippers Clear,Glass Table Top Spacers for Patio Table.Soft Steam Bumpers for Glass Table Top.Suitable for 3/16Inch Hole,15Count. Glass Top Table Bumpers With Stem,Glass Top Rubber Grippers Clear,Glass Table Top Spacers For Patio Table.Soft Stem Bumpers For Glass Table Top,Suitable For 3/16" Hole,15 Count . 1.These Bumpers Fits 3/16 inch holes,So ,Kindly Measure The hole size before buying. 2.These Bumpers Also Can Be Used For Cabinets Door As Dampening Bumpers. Glass Top Table Bumpers With Stem Keep Glass Table Top From Moving Over The Base. Glass Top Rubber Grippers:Soft PVC Material,Rubber Plugs For Glass Table Edge Holes. Glass Table Top Spacers For Patio Table,Clear Color,Nearly Invisible Under The Glass. Noise Dampening Bumpers:Our Bumpers Can Reduce The Noise When You Remove The Glass Top On The Steel Base. Size:Stem Diameter:5mm(About 3/16 Inch),Top Pad Diameter:9.3mm,Top Pad Thickness:3mm,Stem Length:8mm. 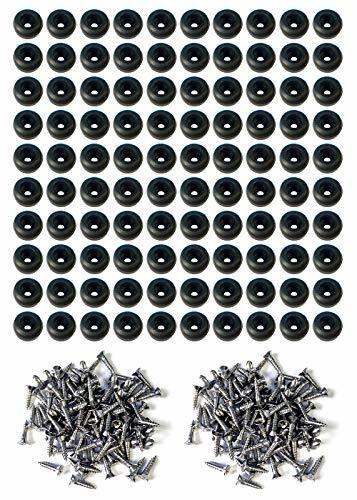 100 Small Round Rubber Feet for Cutting Boards w/Stainless Steel Screws - 0.25" H x 0.5" D - Soft Grip, Non Slip, Anti-Skid, RoHS, Made in USA - Perfect Grips for Furniture, Electronics & Appliances! Our premium American made rubber feet are perfect for all your wood-craft and electronics projects! Everything you need in one box! Each set includes 100 screw in rubber feet along with 100 half inch stainless steel screws, the perfect size for screwing them onto your custom cutting boards and other wood-based kitchen appliances. Premium American made rubber. 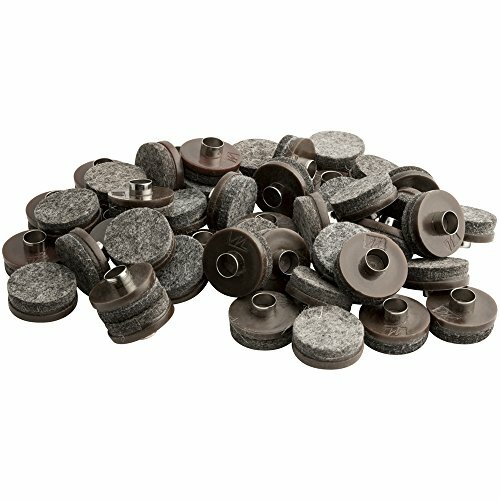 Made in the USA, our small round rubber feet are made from premium grade RoHS and REACH compliant nitrile rubber, an oil-resistant and anti-abrasive commercial grade rubber. They're perfect for cutting boards and any other kitchen-based applications. Small, low profile, and versatile! Our rubber furniture pads are the perfect size for a variety of applications, including custom cutting board feet, wooden cabinet door stoppers, glass table top holders, non-slip chair and stool feet, picture frame spacers, radio gear grippers, guitar amp feet, and many more. 100% satisfaction guaranteed or your money back. We strive to deliver the best rubber bumper feet available for all your custom crafting needs. If you're not completely satisfied with your purchase of our small rubber bumpers, just send them back within 30 days for a full refund. Rubber Bumper Specifications: 0.25 inch bumper height, 0.5 inch bumper diameter, 0.187 inch recess height, 0.25 inch recess diameter, 0.125 inch screw hole diameter. Durometer hardness: 80. Made from nitrile rubber. Operating temperatures between -20 F and 200 F. Avoid temperatures above 450 F. RoHS and REACH compliant. Made in USA. Stainless Steel Screw Specifications: #4 flat Philips head wood screws, full thread. 0.5 inch length, 0.067 inch head height, 0.195 - 0.225 inch head diameter, 0-22 thread pitch. Made from 18-8 stainless steel. RoHS and REACH compliant. Made in USA. Every set includes 100 small round rubber bumpers and 100 1/2 inch #4 stainless steel screws. Rubber foot pads measure 0.25 tall, 0.5 wide & features a 0.125 center hole, fitting #4 screws. Our rubber bumpers complement cutting boards, cabinet doors, glass table tops, and electronics. Long lasting grip and durability when fitted on radio gear, guitar amps, and other electronics. Made in the USA, our cutting board feet are soft, anti-skid, non-slip, RoHS, and REACH compliant. Brand: Gluposti | Manufacturer: Gluposti, Inc.
12 Soft Cutting Board Rubber Feet w/Stainless Steel Screws (0.25" H x 0.687" W) Soft, Non Slip, Non Marking, Anti-Skid, BPA Free, Made in USA - Perfect Grips for Furniture, Electronics & Appliances! Our premium American made cutting board rubber feet are perfect for all your wood-craft projects! Everything you need in one box! 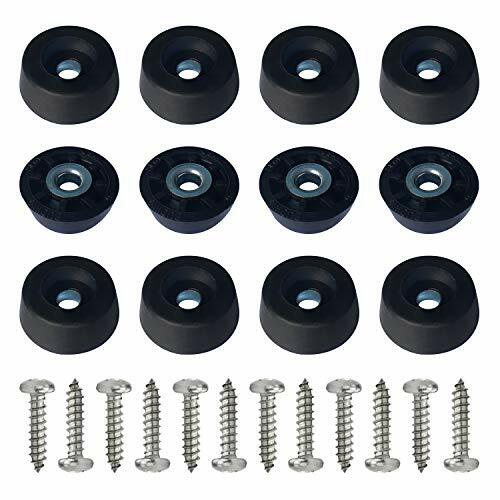 Each set includes 12 screw in rubber feet, 12 metal inserts, and 12 half inch stainless steel screws, the perfect size for screwing them onto your custom cutting boards and other appliances. Premium American grade thermoplastic rubber. Made in the USA, these soft round rubber feet are made from Santoprene thermoplastic rubber, a premium grade rubber which provides superb grip, shock absorption, and cracking resistance. Additionally, this rubber is BPA Free, RoHS, and REACH compliant. They're perfect for cutting boards and any other kitchen-based applications. Small, low profile, and versatile! These extra soft rubber pads are the perfect size for a variety of applications, including custom cutting board feet, wooden cabinet door stoppers, glass table top holders, non-slip chair and stool feet, picture frame spacers, radio gear grippers, guitar amp feet, and many more. 100% satisfaction guaranteed or your money back. We strive to deliver the best rubber bumper feet available for all your custom crafting needs. If you're not completely satisfied with your purchase of our soft small rubber bumpers, just send them back within 30 days for a full refund. Rubber Bumper Specifications: 0.25 inch bumper height, 0.687 inch bumper diameter, 0.18 inch screw hole diameter. Made from thermoplastic rubber. RoHS and REACH compliant. Made in USA. Stainless Steel Screw Specifications: #6 flat Philips head wood screws, full thread. 0.5 inch length, 0.097 inch head height, 0.27 inch head diameter, drive size #2. Made from 18-8 stainless steel. RoHS and REACH compliant. Made in USA. Each set includes 12 small round rubber bumpers and 12 1/2 inch #6 stainless steel screws. Extra soft rubber feet for superior grip on cutting boards, cabinet doors, and glass table tops. Superb shock absorption and crack resistance, ideal for radio gear, guitar amps, and electronics. Cutting board rubber feet measure 0.25 tall, 0.687 wide with a 0.18 center hole (fits #6 screws). Made in the USA, the cutting board feet are soft, anti-skid, non-slip, RoHS, and REACH compliant. GorillaFelt CB259 swivel glides by Slipstick are perfect floor protectors for angled furniture legs as well as straight furniture legs. Plastic ball and socket design provides full swivel action and long lasting wool blended felt base provides quietly smooth and safe sliding on all hard floor surfaces. Includes 8 round 1" felt swivel sliders and 8 screws for installation. When installed, these glides add approximately 3/4" height to furniture. 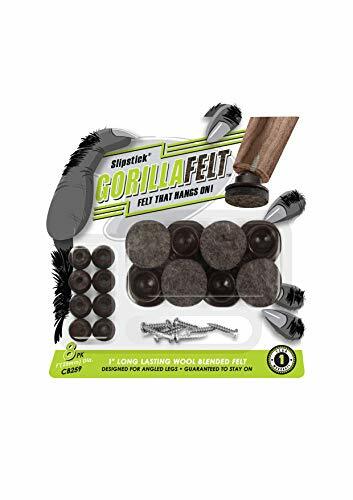 GorillaFelt Swivel glides are ideal floor protectors for chairs, stools, and wooden furniture legs that are " to 1-1/2" in diameter at base. Covered by Slipstick's 1-year free replacement warranty. PERFECT for all furniture. Can be used as furniture sliders, furniture felt pads, floor protectors for furniture legs, furniture movers sliders, sliders for moving furniture, table pads for dining room table cut to fit, felt pads for furniture on hardwood floors. This felt strips with adhesive backing protects hardwood ceramic tile and linoleum floors & surfaces from marring and scratches. Can be used on tables chairs small appliances vases trinkets. EASY to APPLY: Cut it pieces to the length you need and apply. To obtain optimum adhesion, keep the bonding surfaces clean and dry.